Moi Lum was founded in the 1920s by founder Mr. Khong Yu Lum. 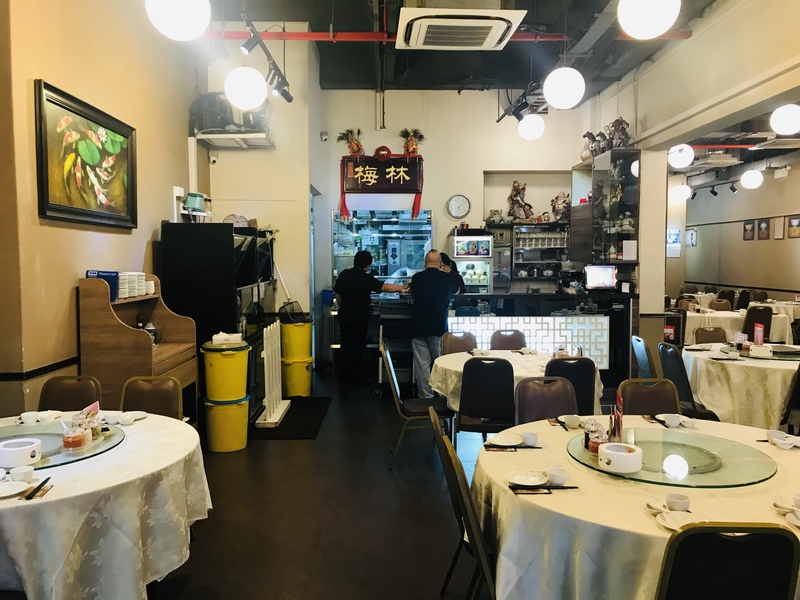 The restaurant started out by renting a shop space in a little coffee shop eatery selling and producing wanton noodles along Tanjong Pagar Road. 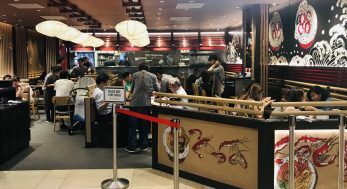 When the coffee shop owners offered to sell the premises Mr. Khong seized the opportunity started the restaurant with his peers from Guangdong. 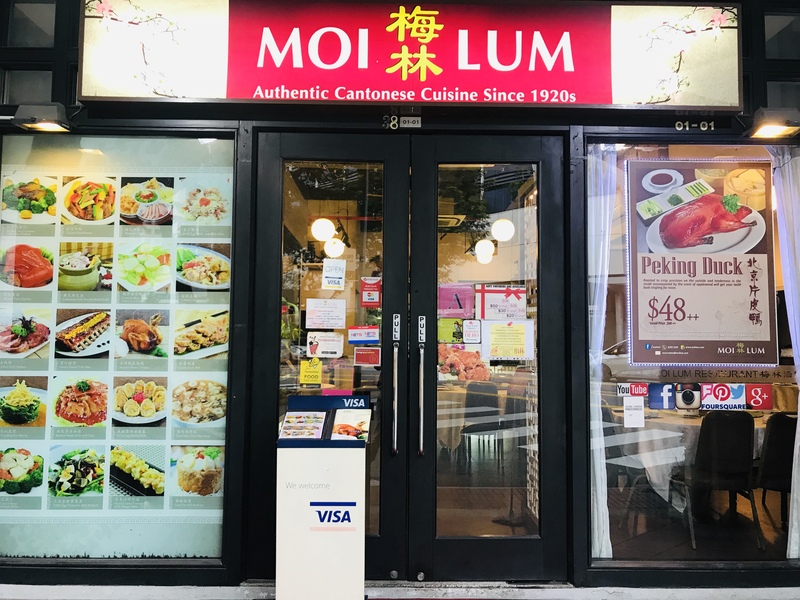 Since then, Moi Lum has moved to several locations in Henderson Road, Geylang Road and Murray Terrace before finally settling into its current location in Airview Building. Stepping into Moi Lum is like stepping back in time to the 1990s. White table cloth drapes round tables with rotating glass tray in the middle, complete with brown upholstered chairs. Moi Lim is famous for their Majestic Roast Chicken [$35 for Whole, $18 for Half]. 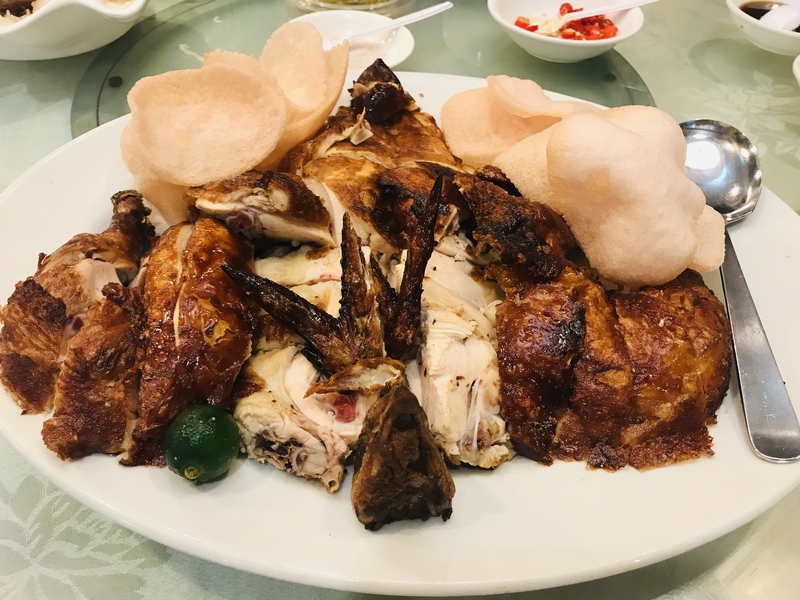 Many people claim that this roast chicken is the best in Singapore. Although I won’t go as far as saying it is the best, but it is definitely one of the better ones. As always when it comes to roasted meats, the skin is the best. The skin is crispy with no lumps of fat underneath, all the fat has been used up during roasting. The meat is tender, even the breast meat is juicy. 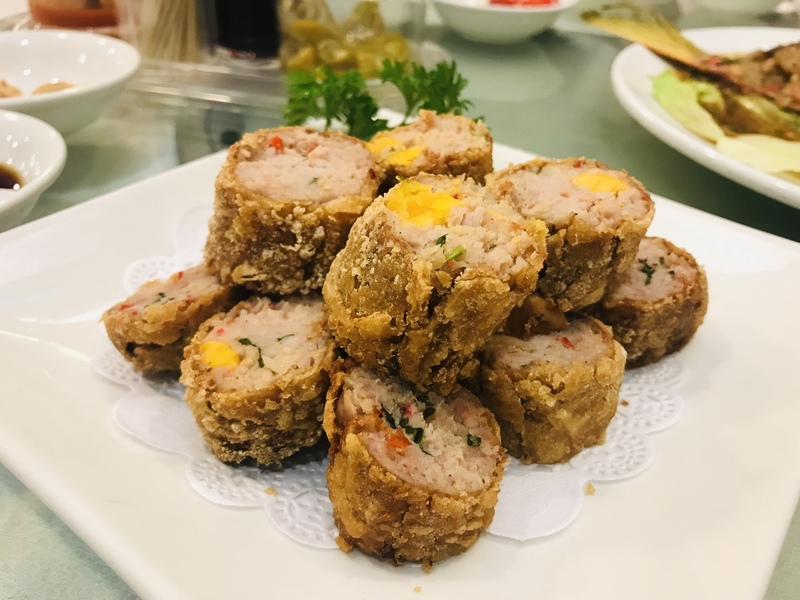 Oyster Duck Roll [$22/$42] is another of Moi Lum’s signature dish. You can’t really see the oysters from this photograph, but the pungent taste of the soaked dried oysters are definitely there. The oysters are wrapped together with duck meat and salted egg with a crispy outer coat. Moist and crispy, savory and flavorful, each piece bursts with flavor. 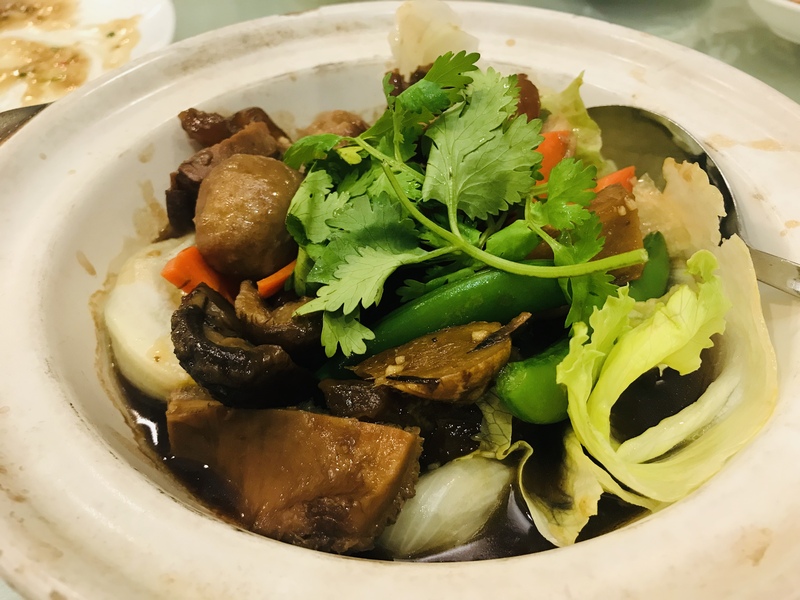 Claypot Beef Brisket (with Tendon and Tripe) [$18] is so good, it made me want to dance. The beef brisket, tendon and tripe are all so tender, which is only possible from long hours of broiling. 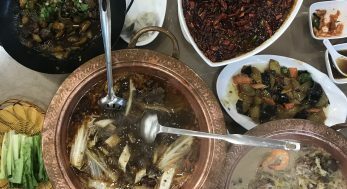 Cooked with Chinese mushrooms and vegetables, it is healthy and delicious. Wasabi Salad Prawns with Mango Salsa [$18] makes for a wonderful appetizer. 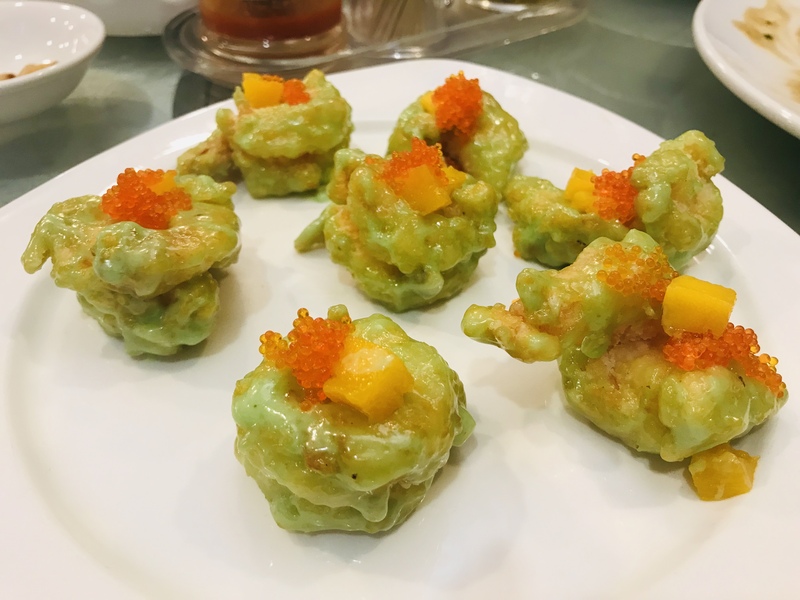 The wasabi-coated prawns does not have a very strong burning aftertaste and the sweet and sour mango salsa and salmon roe topping gives it a nice touch of sweetness. Tofu Fish [seasonal price] is a new dish that the chef was trying out and he wanted our opinion on it. 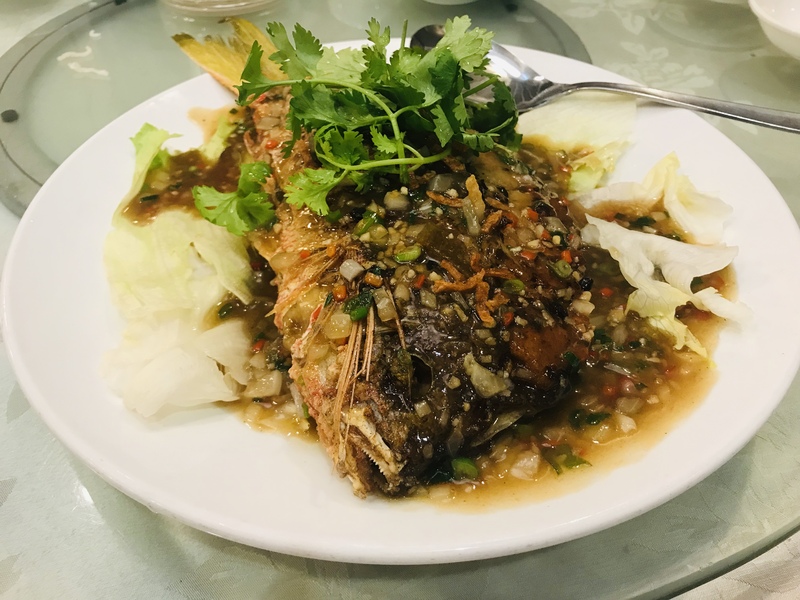 It may look like regular steamed fish, but you will realize the difference as you cut it up. The fish meat is taken out and made into fish paste, leaving only the fish skin. The fish paste is then stuffed back into the fish skin, which is then steamed Hong Kong style. It is not available at the moment, but you can always ask the staff about it. 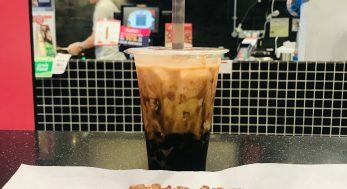 Yam-lovers will definitely like the Yam Pot [$20]. 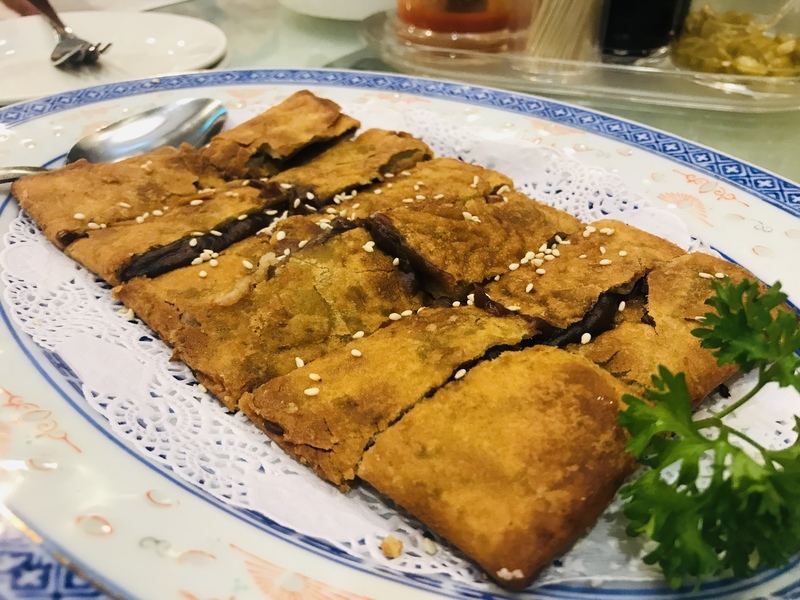 Yam paste is fried and made into a yam wall, the inside is filled with stir-fried vegetables and mushrooms. The yam is aromatic and the vegetables inside balances out the thickness of the yam. 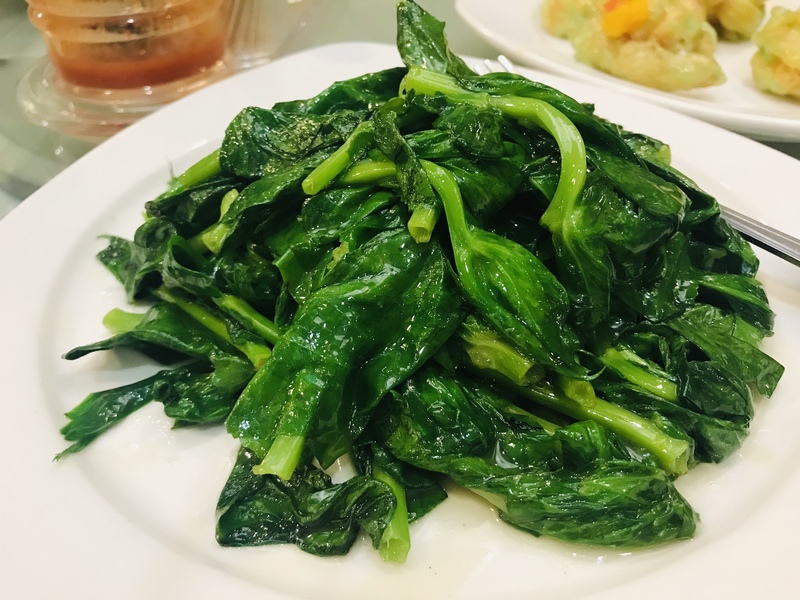 You are forgiven for thinking this is Kang Kong, but this is actually Stir-Fried Australian Pea Shoots. I amazed how they manage to retain the crunchiness and vibrant green color after frying. 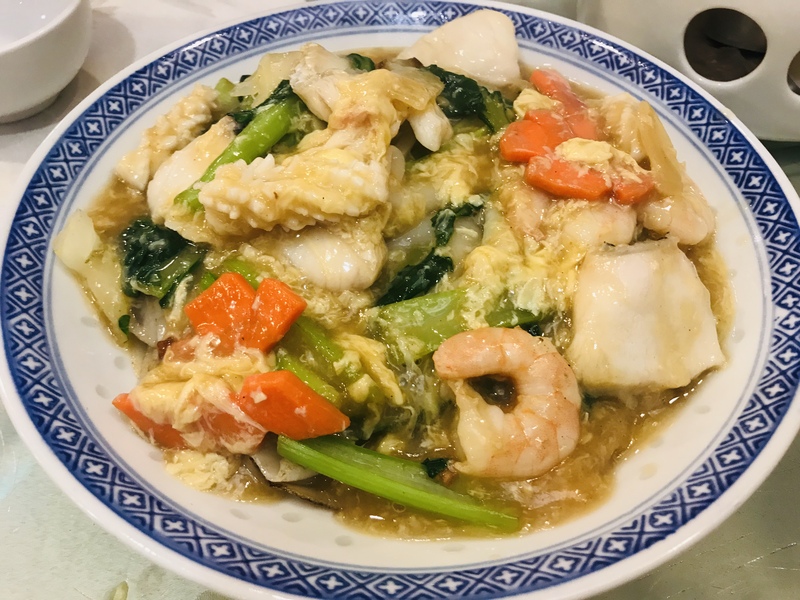 If you are looking for a noodle dish, do consider Seafood Hor Fun [$7 / $16 / $24]. 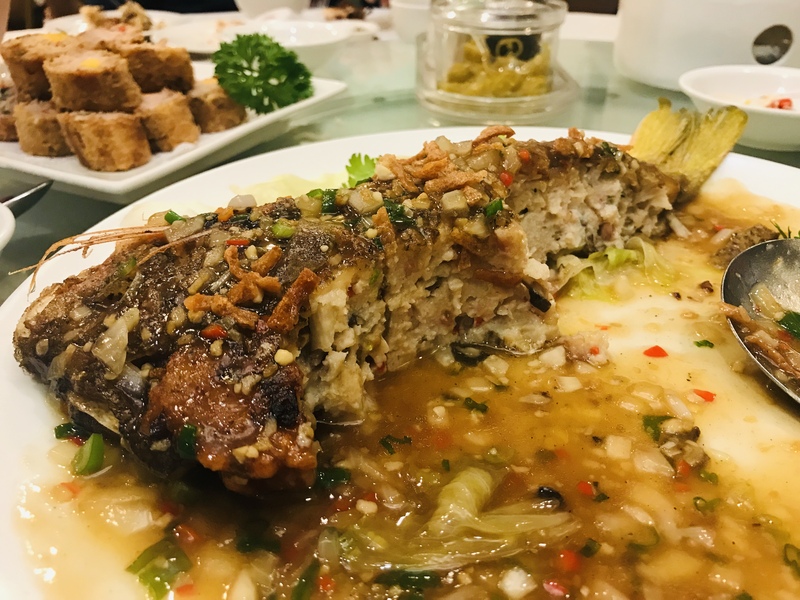 There is generous amount of fish slices and vegetables, the hor fan itself does not clump together and has a nice chewy texture. If you have no idea what to order for dessert, you can’t go wrong with Red Bean Pancake [$12]. I like that the red bean paste is not too sweet and it is perfectly crispy on the outside. For something a little joe adventurous, give Mango Pudding in Young Coconut [$6] a try. 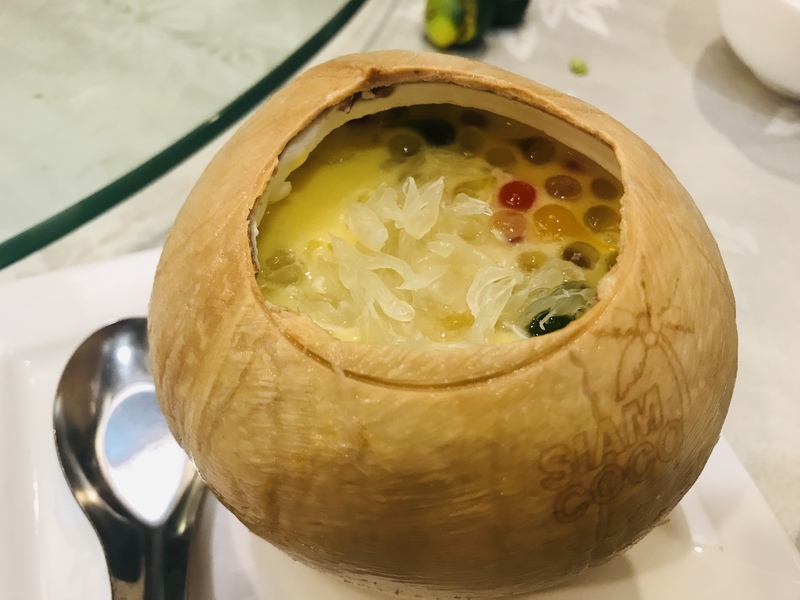 It is basically mango pamelo in a coconut shell, but you will be able to scrape quite a bit of coconut flesh from inside the coconut. A new take on a classic dessert. 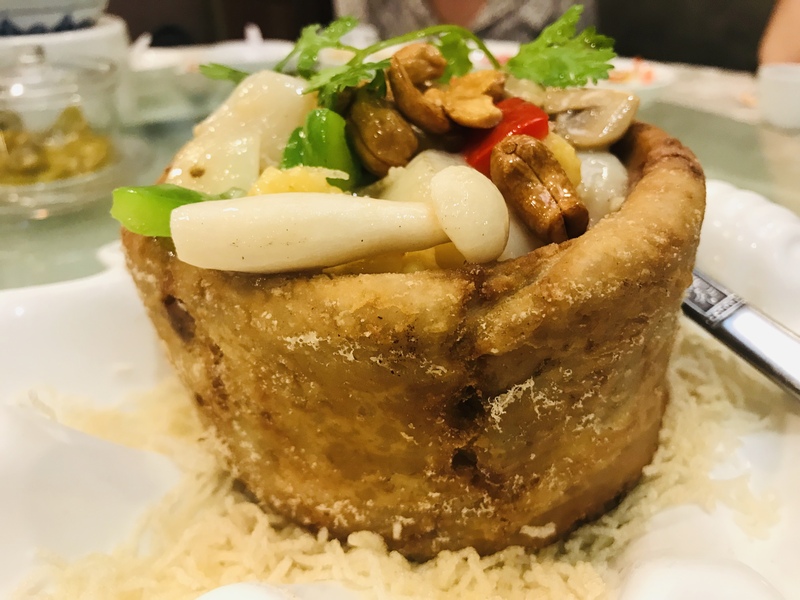 I am not Cantonese so I can’t tell Moi Lum’s Cantonese dishes are authentic, but they are definitely high-quality dishes that makes for a good meal with family or friends.